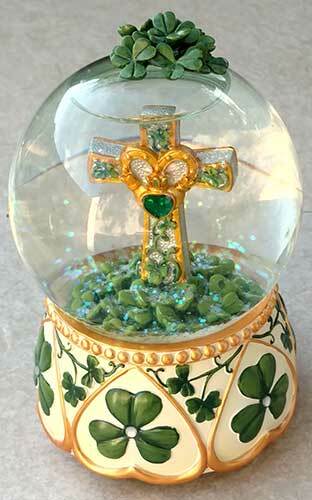 The Irish snow globe features a Celtic cross that is is enhanced with the Claddagh along with shamrocks. This Irish water globe features a shamrocks on the dimensional base along with a Claddagh and shamrock enhanced Celtic cross inside. The Celtic cross water globe is further enhanced with a bed of shamrocks surrounding the cross along with a cluster of shamrocks above the globe. 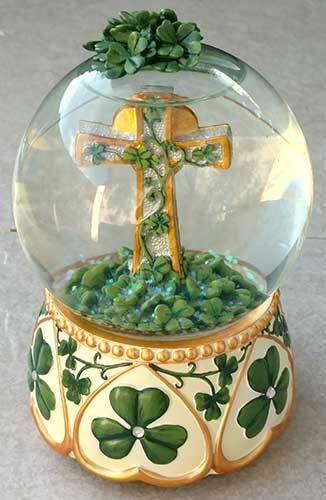 The shamrock snow globe is made of resin and glass; it measures 4" wide x 6" tall. 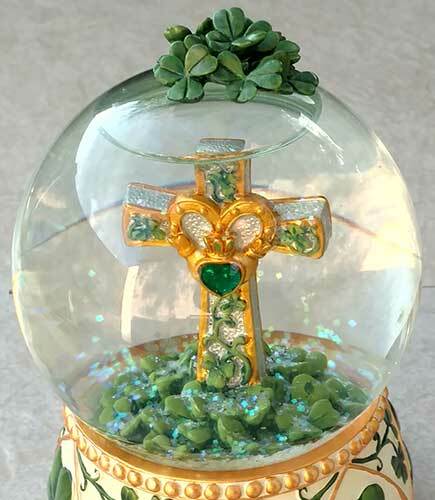 The musical Irish water globe is made by The San Francisco Music Box Company; it is gift boxed with Celtic cross, shamrock and Claddagh history cards, complements of The Irish Gift House.